Our cosmic home, the Milky Way Galaxy is a vast, star-filled spiral in excess of 100,000 light-years wide. After some 12 billion years, and fewer than sixty orbits around the galaxy that each take 230 million years, our solar system is now drifting between two spiral arms at its outer edges in a three-dimensional ballet some 27,000 light-years from its center. Beyond that, like the terra incognita of Earth’s ancient sea-faring mariners, no space craft has ever traveled beyond its opaque central disk the Milky Way to turn back and take its picture. Using the National Science Foundation’s Very Long Baseline Array (VLBA), an interlinked system of 10 radio telescopes stretching across Hawaii, North America and the Caribbean, an international team of astronomers have directly measured the distance to an object called G007.47+00.05, a star-forming region located on the opposite side of the galaxy from our solar system by looking for radio emissions from molecular gas clouds and massive, young stars, both of which typically reside in spiral arms. The measurement showed the region to be some 66,000 light-years away—nearly 40,000 light-years beyond the galactic center, and roughly double the distance of the previous record-holding direct measurement of distance in the Milky Way. The VLBA’s measurement is “equivalent to seeing a baseball on the surface of the moon,” says lead author Alberto Sanna, a postdoctoral researcher at the Max Planck Institute for Radio Astronomy in Germany. The astronomers used a technique called trigonometric parallax, first used in 1838 to measure the distance to a star. This technique measures the apparent shift in the sky position of a celestial object as seen from opposite sides of the Earth’s orbit around the Sun. This effect can be demonstrated by holding a finger in front of one’s nose and alternately closing each eye—the finger appears to jump from side to side. Measuring the angle of an object’s apparent shift in position this way allows astronomers to use simple trigonometry to directly calculate the distance to that object. The smaller the angle, the greater the distance. The VLBA, a continent-wide radio telescope system with ten dish antennas distributed across North America, Hawaii, and the Caribbean, can measure the minuscule angles associated with great distances. In this case, the measurement was roughly equal to the angular size of a baseball on the Moon. 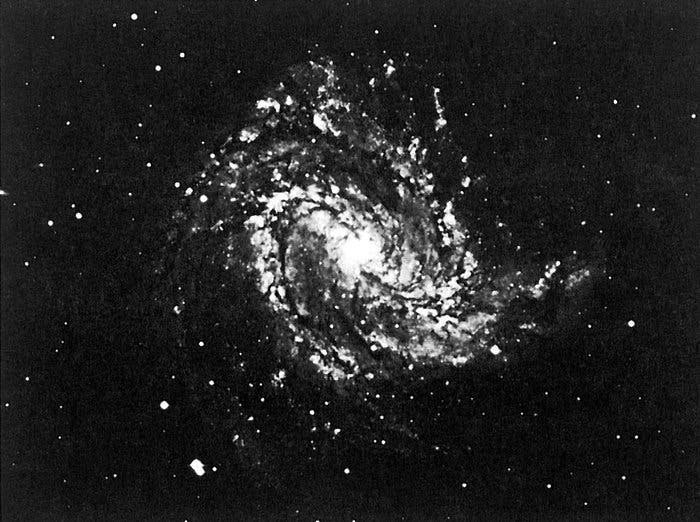 ESO Image at top of page shows a Milky Way-like spiral galaxy, southern spiral galaxy NGC 5236, also known as Messier 83.